Last season’s Women’s EHF Cup champions SCM Craiova (ROU) begin their title defence against German side Borussia Dortmund. 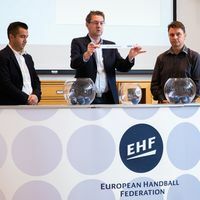 Tuesday morning’s Qualification Round 3 draw was carried out by EHF Chief Sports Officer Markus Glaser alongside Radek Madera, DHK Banik Most representative, and Bajan Gabi, SCM Ramnicu Valcea club president. 2007 Cup Winners’ Cup champions Valcea were drawn with 2011 EHF Cup winners Herning-Ikast Handbold, one of four Danish sides in the draw. Despite there being no country protection, none of the four Danish clubs will face each other, although Nykøbing Falster Håndbold were handed a Scandinavian derby against Swedish side H 65 Höörs HK. The first leg of qualification round 3 takes place on 10/11 November, the second leg will follow one week later. The 12 winners qualify for the group phase, where they join the four bottom-ranked teams of the Women’s EHF Champions League Group Matches.